Price of gas $0.91 in Saudi Arabia, $0.78 in Kuwait, $1.74 in Puerto Rico (part of the USA). So how can that be? It costs less than a dollar to produce a barrel of oil in Saudi Arabia—I know, I worked for Saudi Aramco, the Saudi oil company. The price of crude is not driven up by speculators. It is set by collusion between the USA and OPEC. – a dollar a gallon! The artificial cost of crude oil accounts for 73% of the cost of gas at the pump. Now crude is at $100 a barrel. 73% of $4.00 per gallon comes to $2.92. 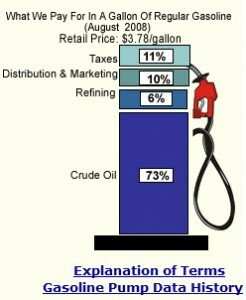 All the other components for your gallon of gas come to $4.00 minus that $2.92 for crude, which equals 1.08 per gallon. Let’s not be greedy – let’s give the Saudis and the others a chance to have a decent 1000% profit. That would bring the price of crude to $10 a barrel. The cost component of crude in a gallon of gas would then be one tenth of $2.92, or 29 cents. Then a gallon of gas at the pump would cost $1.08 plus $0.29 = $1.37. Well, except that certain oil producing countries have driven themselves so far into debt that they need the revenue to service that debt. Oil rich Saudi Arabia, needs $80 a barrel just to service it’s debt. In fact, on January 16, 2012, Saudi Arabia announced its target price was $100 per barrel to sustain its public expenditures. Debt is the demise of capitalism.